An excerpt from the book, The Gospel Writers. Civilization is the domestication of humans by other humans. In fact, we are the only indigenous life on our planet who tries to domesticate each other, along with other animals. This domestication can range from a mild form, which helps us to adapt to close-quarters living in population centers, or the more severe form which uses ghosts, gods, spooks, and spirits as a tool for domestication. The earliest domestication of significance is the form developed by walled city-states in Mesopotamia c.6.500 BCE. At this time, democratic assemblies were being replaced by kingships; and as we know kingships eventually were replaced by hereditary monarchies. From those who have not read the book, The Gospel Writers, I often get the question, "How do you know for sure that there is no god?" I answer them in this way, "There is only one way to prove to you that a god does not exist; and that is, to prove to you why one does." I would start by saying that it is all about "legitimizing ownership." That's the key. When a potter makes a pot, he has the right to do with it what he wants, including charging you for using it. When a basket weaver makes a basket, he has the right to do with it what he wants, including charging you for using it. When a god makes a planet, he has the right to do with it what he wants, including charging you for using it. To own something that was never yours to own in the first place, requires that some kind of "original owner" exist, and that this "original owner" (at a minimum) "gave" it to you. When the original owner cannot be found, such as the "original owner" of the land, invent one. Tell the people on the land that the "original owner" is an all powerful god, and that you have spoken with this god, and that this god has given you all of the land as a gift for being a good and just person; and because that god knows that you will make sure that all of the people on the land will worship that god. Why a fictitious god, you ask? Because at this time in history, a god (like a Supreme Court) would be the highest "Legal Authority" in the land and therefore any laws and contracts (rulings) handed down by a god could not at this time, be nullified or overturned. Clever legal loophole, wouldn't you say? Make sure you call it a lord (top authority) god; a lower ranking god will not work. And, do not be naive and think that your army alone will keep the people submissive to your will. They must believe that you have the legal right by divine authority to take control of the land; otherwise you will spend much of your time and money trying to put down rebellions that will spring up from time to time. You do not need to brainwash them extensively with religion. Because, what they worship is generally unimportant, as long as you maintain ownership of the land by (fictitious) divine authority, which will allow you to control the people on the land. The people know, that for anyone banished from the land, it will mean agonizing loneliness (because they do not speak the languages of the people in other lands) and eventually death. You can always threaten someone with banishment, if they try to rebel and make any statement that refutes your fictitious legal right. Once you have told the lie, you can never admit to anyone that the "original owner," (the maker of the land -- a god) never existed. You must silence or kill anyone who tries to say that the "original owner" never existed, or that the whole thing was a hoax to steal the land from the people on the land. There is an alternative to silencing or killing the people who do not support the "original owner" hoax or idea. Buy their loyalty; but buy it with something that costs you nothing to give away. Tell them that the "original owner" will grant them "immortality" in exchange for worship and belief in him, as the "original owner." In addition, tell them that this immortality will be spent in a place of great beauty and love, where they can be reunited with loved ones who have already died. And they will be gullible enough to believe you. Why? Because everything comes back to life after death, such as the Sun each day, the Trees each spring, and even you by way of your first-born son; who looks like you. To get the people to work the land that you have now stolen from them, using Lessons 1-4 previously discussed, so that they will generate wealth for you and other Ruling Class members, tell the people that it is the "original owner's" wish that they toil and suffer, so that when they get to that place of great beauty and love, they will appreciate it more. And, that they will never have to work again, once they get there. Plus, they will always be loved and never abandoned by the "original owner." Tell the people that the "original owner" is invisible and cannot be seen or described. And, that the "original owner," has no name; in other words, he is not like anyone the people might have heard of before or might run across later. Tell them also, that the "original owner" can see into their hearts and minds, twenty-four hours a day, ever day of the year. And that, the "original owner" will know, by looking into their hearts and minds, if they do not love him in return or are thinking of abandoning him, (even though he would never think to stop loving them or of abandoning them). This will make them feel very fearful from being under a watchful and invisible eye every moment of their life, with absolutely no privacy anywhere on the planet, and feel very guilty for not loving and staying with someone who loves them. In other words, someone who would never abandon them or become disloyal. This fear and guilt will help them to remain loyal. Remember to tell the people that the Earth was made by the "original owner" in 6,500 BCE; so they do not go looking for the "democratic" non-kingship model, prior to that time. You do not want the Ruling Class - Worker Bee model to be discovered, as the hoax it is; or you will have an expensive and time consuming rebellion on your hands. a. 6,500 BCE + 2,009 CE = 8,509 years since the hoax for stealing land has been going on. b. 6,500 BCE + 2,009 CE = 8,509 years since the Jewish god created the Earth and all the life forms on the planet. c. 8,509 divided by 8,509 = 1.00 or 100% of the time, civilization has been going on the way we want them to believe it has. Therefore, it is perfectly normal to live life the way they currently are and there was no other type, ever. b. 150,000 - 120,000 years since our species has been on Earth (anatomically modern Late Pleistocene humans - from Mitochondrial Eve - White et al. 2009). c. 8,509 divided by 135,000 (arithmetic mean) = 6.3 percent of the time. The hoax for stealing land has been going on for less than 10% of the time since we, anatomically modern Late Pleistocene humans, have been on Earth. Or, about 472 generations of your ancestors out of about 7,500 generations of your ancestors. In other words, an extremely brief time; and not a very long time as Old Testament religions and the Ruling Class need the Worker Bees to believe. Conceal this at all costs forever or we, the Ruling Class, Old Testament religions, and Figure Heads, are all doomed. And, even though Turkey was the real "Cradle of Civilization," tell them that Mesopotamia was instead. We don't want them to know about Turkey either. Next week, we will teach you how to keep this newly stolen land wealth in your family, through the use of a new invention called "Hereditary Monarchies." It's a more advanced version of the hoax you are currently using for your kingships, and it will keep democratic assemblies from forming once again (such as those prior to 6,500 BCE), after your death. End of Lessons. As I mentioned early, I would answer them in this way, "There is only one way to prove to you that a god does not exist; and that is, to prove to you why one does," which was for the purpose of land ownership and taxes. Whether it was the LORD of the gods, Yahweh (Jewish god of the Hebrews), during the time of Moses, or the LORD of the gods, Marduk, during the time of King Cyrus of Persia (see Cyrus Cylinder -- The British Museum in London), LORD gods were legal and social domestication tools for the Ruling Class and their Figure Heads and nothing more. a. Ownership of the land. b. Ownership of everything on the surface of the land, including water. c. Ownership of everything below the surface of the land, such as gold, diamonds, granite, limestone, etc. d. Ownership of everything living or dead on top off or below the surface of the land. Including the taxes collected on the land of our planet, how many billions upon billions upon billions of dollars would you expect the dollar amount that this land-and-tax hoax represents, which also included all mineral rights, lumber, animals for food and trade goods, water rights, etc.? Do you think some minority Ruling Class group, might lie to keep an aggressive hold on this wealth? How about a religious organization, the ones who legitimized the taking of the land in the first place? Do you think they might lie to keep a firm and continuous hold on this wealth? If you were to suddenly become the inheritor of the same massive chunk of land that King Cyrus of Persia claimed legal ownership of, what would you be willing to do to keep it? And at the same time, what would you be willing to do to keep all the people on that land from rebelling due to your illegal ownership of that land? Manipulating our ancestors into believing that Old Testament religions were about spirituality, immortality, ethics, and morality, was a ruse to keep them, and now us, focused on something that sounded very important to pay attention to; and simultaneously, away from figuring out the real function of religion. So are we a modern civilization? Hardly. A very small group of people still claims to own all of the land and its resources on our planet, which legally belongs to all indigenous flora and fauna on our planet. They acquired ownership, first by fictitious LORD gods, and now they maintain ownership by armies in addition to religion. "The earliest domestication of significance is the form developed by walled city-states in Mesopotamia c.6.500 BCE"
That's un-possible. God hadn't even created the planet yet. For all those who suffer in ignorance and denial of how it was in those days and how kings claimed land. "The worship of Marduk, the king of the gods, he [Nabonidus] [chang]ed into abomination. Daily he used to do evil against his city [Babylon] ... He [Marduk] scanned and looked [through] all the countries, searching for a righteous ruler willing to lead [him] [in the annual procession]. [Then] he pronounced the name of Cyrus, king of Anshan, declared him to be[come] the ruler of all the world." "Thus saith Cyrus king of Persia: All the kingdoms of the earth hath the LORD, the God of heaven, given me; and He hath charged me to build Him a house in Jerusalem, which is in Judah. Whosoever there is among you of all His people--the LORD his God be with him--let him go up." (2 Chronicles 36:23). True, the American Indians were not that way about owning land but the Indians were still in the stone age and had not developed to the "kingdom" stage. Now, the Aztec and Mayans were of a different coat than is given by Questeruk and their kings did claim the land. So much for ignorance and denial. The writers of the first five books of the Bible (and it wasn't Moses) very plainly claimed that the Lord God gave them the land of Canaan. It was a lie then and it's a lie now. “Now, the Aztec and Mayans were of a different coat than is given by Questeruk and their kings did claim the land. Hey Corky, pointing out a weakness in someone’s argument doesn’t mean the other person is ‘ignorant’ and ‘in denial’. But then I suppose you consider anyone that believes in a god must be ignorant, stupid or insane. As a matter of fact, NO, I don't. Think for a minute; if you lived in a world in which no one believed in gods or goddesses but you did, how would you go about proving there were? Now, prove a god exists without using anything that any man has said or written to do so. It's the same as I can't prove that there is an invisible elephant in my living room but I am expecting you to take my word for it - otherwise you are lost forever. It's just plain ridiculous and believers are just ignoring the facts and are in denial of reality. "The greatest proof to me is the fact that life is here." That in no way proves that there is a god. All it proves is that life is here. It in no way points to a creator, much less a supernatural creator. To think otherwise is to view through the lens of one who already believes in some sort of supernatural creator. "The greater research that is done provides more conclusive proof of the impossibility of life arriving where it is without some form of higher power." No it doesn't- unless your "research" sources are written by those who already believe in a supernatural creator. So what "research" are you refering to?? "The reason evolution is absolutely considered to be the solution is that without a higher power there is not thought to be an alternative..."
That's not true, either. There could be several million other explanations, though they may beyond our imagination at this time. The reason evolution is so widely accepted is because it is supported by evidence- unlike the fairy tale of a supernatural creation. "All the evidence is viewed through the filter of evolutionary ideas." Darwin constructed the theory of evolution ~after~ he spent time reviewing his data, not the other way around. That is the difference between science and religion, or reality and fairy tales. Science looks at the evidence and arrives at a conclusion based on the evidence. Religion ~begins~ with a conclusion (based on ancient religious texts or subjective feelings)and...well, and that's about it. If any evidence comes along to support the conclusion, it may be accepted, but if any evidence refutes the conclusion, the evidence is abandoned. "That this is true was shown by the experiences of atheist Sir Fred Hoyle." What? An atheist astronomer rejected evolution? A striking blow to not only the theory of evolution, but to atheism! Hoyle's basic problem with abiogenesis was incredulity and faulty assumptions with regard to his moth-eaten statistical situation. "This is the point I am making. Atheists limit themselves, because they are not prepared to acknowledge the possibility of a higher power." I certainly do not. God may exist. Just as leprechauns may exist. "To NOT believe in a god is as much a matter of faith as it is to believe in a god." This is a very old discredited canard. Please do some more reading and then report back. You can also just google Austin Cline and click on the first hit. You can then be ready to add immeasurably to your fund of knowledge. Opposing views always sharpen the argument. "This is actually my main point. To NOT believe in a god is as much a matter of faith as it is to believe in a god." "My point was that nobody can prove how abiogenesis occurred. Full stop....Austin Cline can claim to say Atheism requires faith is a false, deliberately misleading story (a canard), but that flies against the definition of faith." What exactly is your point? Atheism and abiogenesis are two different things. One is a lack of belief in gods. Another is hypothesis concerning the origin of life. Following me so far? You are trying to show that atheism requires faith by showing that abiogenesis requires faith. This is, to use the scientific term, totally retarded. Why don't you try something a bit easier. Like demonstrating that since apples are sweet in taste, then it is impossible for Brazil to produce the world's most talented violinists. Christians don't actually have faith in God, Jesus, the Bible, miracles, or revelation, but only in the stories of other men (which might or might not be accurate). There's no way around it, religious faith is always placed in the traditions and writings of men, often long dead. So the question becomes, why in the hell would a God reward you or anyone else just because they put faith in the traditions and writings of ancient men? First off, please try to understand that the dictionary isn't a lawbook--it's akin to a history book. It doesn't instruct how words SHALL be used but how they HAVE been used. To base one's argument on a dictionary definition is weak. (I find it interesting that the theist will quote a secular dictionary for his point on faith and ignore the Biblical definition. But, then, all theists are not Biblicists). Now, atheism makes the point that theists have no proof for their gods so they place great emphasis on "faith"--belief without evidence. (Firm belief in something for which there is no proof--Webster's Collegiate 11th ed). It is a little humorous that the theist then comes forward to attack the atheist because he also allegedly operates on faith. Both the theist and the atheist it is alleged are irrelevant because they cling to faith--belief without evidence. (Please show me the praise directed towards atheists like Richard Dawkins, Sam Harris or Christopher Hitchens that here are atheists living by great faith. It would be the height of absurdity to intelligent readers). I am an atheist. I have no belief in any of the gods men have manufactured. Get that? I am without belief. I lack belief. I have no belief. How can that be a faith? We have the evidence that men did, indeed, create the gods. I need no faith for that. It has been documented. The history books on religion are filled with it. Try reading a book on the history of religion like Pascal Boyer's "Religion Explained." To accuse the atheist as being as ignorant as the theist just won't stand and it's somewhat injurious to your position to claim so. Again, it is the burden of the one affirming the existence of gods to provide undeniable proof. You are merely affirming you have none by your claim to faith. The atheist has no such burden. That's the beauty of the argument and the weakness of your claim. BTW--Your attempt to bring in another subject like abiogenesis is totally irrelevant. It merely served as a deflection and failed. Neither of us *knows* how life began. I think you misunderstand where I am coming from. I am not trying to put down atheists. You believe what you believe – that’s fine, that’s your choice. I believe what I believe, and I hope that is fine by you. A dictionary defines the way words are being used. It is a reference point for common understanding. It’s only if both parties understand the same meaning for a word that they have any hope of understanding each other. To say ‘basing one’s argument on a dictionary definition is weak’ is missing the point entirely. I am quoting the dictionary definition so we can both have a common reference point on what is being discussed. The dictionary definition of a word is a common starting point. That shouldn’t be too difficult to understand should it? Your attempted ‘put downs’ are based on you using words such as ‘faith’ and ‘belief’ in a different way to the way I am using them, and your apparent fear that if words like faith and belief are applied to an atheist that would be some sort of weakness. It would help your perception of others if you could realise that most people on this board have come to the position they are in after intense though and study in many different fields, and that someone is not an ignorant simpleton simply because they believe different to you. You just don't get it, Ques. The lack of belief is NOT a faith. Next: The English dictionary is only a guide to word use in an imperfect language. And word usage is expanded and appreciated in context. Lucky we have it or there would be even more confusion in the world as the theist would introduce by your incorrect use of "faith." A difficult word in a theological context that has spawned whole libraries of discussion. Your inability in this thread to get to the common reference point you seek is a result of your insistence on calling a lack of belief in gods a faith. It's rediculous but understandable as Skeptic Pro wrote. You wrote, "...if words like faith and belief are applied to an atheist that would be some sort of weakness." No, the usage is simply a lack of needed clarity of thought. It all could be simplified if the theist could simply produce the proof of even one god. That as yet unobtained object would certainly shift this exhausting and boring battle over the meaning of faith. (I have to admit my sensitivity to the incorrect use of "faith" is a result of living by faith for 25 years in the make-believe world of a Bible-based cult. Whenever the handlers had to manipulate us, faith would be trotted out to do its job. And it always worked until I started to think outside the box--that is, critically). As to the "intense thought and study" you seem to infer you have done, it is not evident in your attempt to use a word in a context unrelated to common usage. Tell me, please. Have you read any of the best sellers by atheists like Richard Dawkins, Sam Harris, or Christopher Hitchens on atheism? How about the very helpful older book by George Smith "Atheism: The Case Against God". Maybe you've done some independent grounding of yourself in understanding atheism by some original research and writing. Hmmm? Maybe you've found the atheist quote calling the lack of belief a wonderful faith? I think not. Also note that you used the phrase "ignorant simpleton", not your opponent. I believe that we are going to live until we die, in fact, I have the utmost faith in that. However, I have absolutely no faith that a god exists and that's not a faith that's a non-faith. Ques:You said you had read a number of books on atheism. You mentioned a book by Dawkins which isn't his bestseller on atheism. I would be interested to hear of what books on atheism you had read. The polite responder would have named them had he done so. If you like, name a few of the books that strengthen your theism. That list can be telling also. As for continuing with "faith"--that has been beaten to death here. "Belief without evidence in what is told by one who speaks without knowledge of things without parallel." Golly! That Twain guy is really sharp. With the theist walking around with that definition is his head he hasn't a chance of clinging to his make-believe. 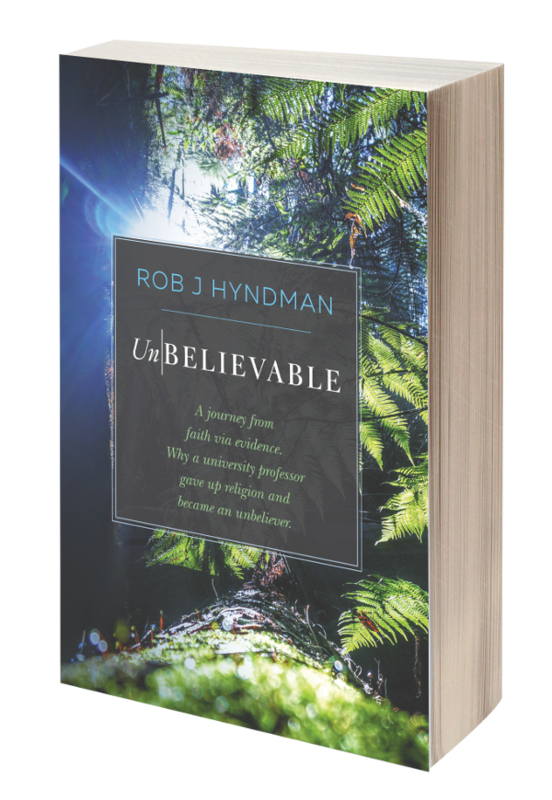 "Faith may be defined briefly as an illogical belief in the occurance of the improbable." You haven't even begun to understand the meaning of faith without reading the whole of the definition in the scholar's dictionary we produced. The tiny quote by Questeruk only serves to manipulate the reader to Questeruk's own self-serving bias. "Faith, abiogenesis and atheism are all linked." Does it take "faith" for you to reject the existence of leprechauns? What about unicorns? Darth Vader? Does it take a measure of faith to maintain your disbelief in the goddess Kali? Does it take a conscious effort on your part to deny that Zeus is alive and well, living on Mount Olympus? Allah? An emphatic "No." It does not take faith to reject what isn't. However, accepting the existence of something that isn't takes a lot of faith; in fact, it takes a large dollop of irrationality and the willingness to close your mental eyes, plug your mental ears, and cover your mental mouth and jump into the lake of cognitive dissonance. But you know this, don't you? You just choose to apply it to everything but your particular imaginary being. He gets a pass, a free Get Out of Reality card. It's hypocritical in the same way you apply the scientific method to everything- except for your particular imaginary being. But anyway. To abiogenesis. A big difference between Kreationism and abiogenesis is that one proposes a process, or a series of mechanisms by which life came to be. The other doesn't- well, besides "Goddidit" or "magic." The mechanisms of abiogenesis- which were hypothesized many decades ago-describe a pathway from simple elements to simple molecules to more complex molecules to self replicating molecules to these molecules forming simple cells (simple vesicles enveloping the simple replicators), and on and on to the simple organisms we find in 3.5 billion year old rocks. And from there, evolution. Which DID happen, by the way. The biggest difference (besides one having a hypothesized mechanism and the other not) between Kreationism and abiogenesis is that those hypothesized mechanisms have been shown. Scientists have produced them in the lab. It is a fact that the hypothesized mechanisms can happen. We can form complex molecules from simple elements (We've replicated and gone far beyond Miller's first experiment, so if you want to bring that up, then do a bit of research first), and using complex molecules can derive self replicating molecules- which can be contained in primitive vesicles (just like cell membranes), which can form spontaneously from simple molecules. Simple, primitive "cells". Just as hypothesized. So there is a solid basis behind the hypothesis. It can happen. Gentlemen, it is possible. We've watched it. Unlike the hypothesis of Goddidit. Hell, Kreationisists/IDiots haven't even provided the world with any mechanistic hypotheses, much less shown that it is possible! But as to whether abiogenesis actually did happen, is the mechanism that sparked evolution- we don't know for sure. I don't know. That is why I do not accept abiogenesis as fact. That is why it takes no faith for me to accept that it could have happened- because I know, from the literature, that the mechanisms have been demonstrated to work. Unlike Kreationism. You accept it as a fact. Without any proof. None. You need faith. You can't fall back on an incident recorded in 1965 where a simple organism flashed into existence at the behest of prayer. You have no recordings of sheep popping into existence in a French village in 2005. Do you get my point? There is nothing, nothing at all to support your hypothesis. I do have evidence to support mine. This is why I can accept that it may have happened. And it takes no faith. Anyway- I know this has been futile, but I can't let it pass. "Thing is with your continual harping on leprechauns, unicorns etc. Just how many people believe in them? It’s going to be a minute number isn’t it." And totally irrelevant. Would you please answer the question? I have yet to get a straight answer for this question from a Christian. Why is that? It's a perfectly valid question. "A belief held by 90% of the population should be treated with less disdain than a belief that in reality doesn’t rate as a belief." Are you serious?? So, if a large majority of people believe in leprechauns, we have to give it much more weight than belief in Jehovah, that is, if only a minority believed in Jehovah?? Q, reality doesn't work that way. But again, you know this. We don't gauge the existence of something by the number of people who believe. You should be ashamed of yourself. You are smarter than this, I believe. To use your reasoning, Christians should give equal weight to the existence of Allah because the number of Muslims in the world is approaching the number of Christians. You should give evolution more weight than Kreationism because more scientist accept evolution. "We could carry on going round in circles – after all leprechauns and unicorns are as likely to have evolved as the duck billed platypus,"
Leprechauns? No. Leprechauns are supernatural beings. Unicorns? Sure. Why not. "...but this topic is grinding to its end." Right. Because you have been solidly refuted, and have nothing left. You know when to go home. Come back when you have solid evidence. “Q, reality doesn't work that way. But again, you know this. We don't gauge the existence of something by the number of people who believe”. Paul, I had to come back on this one, because I believe that we actually agree on something!!!! You know that I wasn’t saying that if a majority believe something, then it is true. Never have I ever said anything like that. In just the sentence before I made the point:- “This means that atheists are very much in a minority. NOW THIS DOESN’T MEAN THEY ARE WRONG” (emphasis mine!). But I did go on to make the point that a belief held by a large number of people should perhaps at least be considered a little more than a view held by very few. The flat earth society is not very big, because it is difficult to convince people of their cause. You know I don’t believe ‘the majority is right’, and neither do you. But if a large number of people did believe in leprechauns, then just maybe it would be worth checking exactly why they had this belief. "But I did go on to make the point that a belief held by a large number of people should perhaps at least be considered a little more than a view held by very few." "Christians should give equal weight to the existence of Allah because the number of Muslims in the world is approaching the number of Christians. You should give evolution more weight than Kreationism because more scientist accept evolution." No, we shouldn't look into, or give more credence to, the existence of something for which there is no proof simply because a majority of people believe so. In a few decades, there very well may be more Muslims than Christians. At that time, will you seriously give equal consideration to Allah and the Koran as the "true" god and "true" scripture over Jehovah and the Bible? Will you apply your own words to your beliefs? No, you won't. You are simply talking out of your arse, trying to defend your claim. Now, for the third time, does your rejection of the existence of leprechauns take faith??? "Are you happy with that answer? It does represent my views on the matter of leprechauns." So you believe that leprechauns may indeed exist? By the way, I don't believe a damn word you said. You don't believe in leprechauns and if you were asked in another situation (one that didn't involve a debate on the existence of imaginary beings) you would probably give a curt, "no, I don't believe in leprechauns." It's more a shoe, than a box. And it fits quite nicely. First off, you're dealing with a theist. One who quotes a stupid song about unicorns and now opens the door the leprecauns. He couldn't handle a rational discussion after I got through with him. It's interesting about these theists like Ques. When they run out of their parroting points they eventually shut up. There is just nothing else there. I've yet to read one admitting his opponent made a point. thought out challenges. But I guess it's good for us atheists to continually be on our toes for them. The logic of atheism will always triumph over the lack of it as we've seen demonstrated by Ques in this thread. I will just ignore him now. "They show up later with more poorly thought out challenges." And to the man, the same poorly thought challenges and the same mischaracterizations and generalizations used by theists for the last few hundred years- all of which have been debunked and dealt with time and time again. But, it's all they have.